The Fastest Way to Street Readiness. Guaranteed. This is the official white-to-Gracie Combatives-belt curriculum of Gracie University. Once you perfect these techniques you can test for your Gracie Combatives belt online or at any qualified Gracie Jiu-Jitsu Certified Training Center. Gracie Combatives has been added successfully to your wishlist. Although Gracie Jiu-Jitsu consists of more than 600 techniques, studies of the fights conducted by members of the Gracie Family show that 36 techniques have been used more often, and with greater success, than all the other techniques combined. Originally developed for the U.S. Army, Gracie Combatives is the only course that is entirely dedicated to the mastery of these 36 essential techniques. Up until now, this course was taught exclusively at a small network of Gracie Jiu-Jitsu certified training centers, but now, for the first time ever, the complete Gracie Combatives course is available on DVD and can be learned from the comfort of your own home! What makes the Gracie Combatives collection so unique is that it is the only instructional DVD series ever produced with the sole objective of taking the viewer - regardless of their age, gender or athletic ability - from no knowledge to street ready without ever stepping foot into a school of martial arts. Every other instructional video series to date was designed to give viewers additional techniques and tips to complement the training they were receiving at an actual school of martial arts, whereas the entire Gracie Combatives series was produced under the assumption that the viewer had absolutely no previous experience and, for one reason or another, would never have the privilege of learning at a Certified Gracie Jiu-Jitsu Training Center. What separates Gracie Combatives from other martial arts instructional DVDs is a revolutionary teaching system called Dynamic Reflex Development. Although there are thousands of martial arts instructional DVDs in existence that show the viewers how to do various techniques, up until now, there has never been an instructional series that gives the viewers the exact system they must follow to develop their reflexes in the execution of all the techniques in combination with one another. Using the Dynamic Reflex Development teaching system, you will be introduced to Gracie Jiu-Jitsu the same way young children are introduced to a language; first, they learn the letters, then they learn how to make words, and then, finally, they can make sentences and paragraphs on their own. In each Gracie Combatives lesson, the new technique is first presented to you in the form of simplified drills, or Technical Slices. Then, it is combined with one other technique in a Reflex Development Drill. Finally, at the end of each lesson, you will learn how to execute the newly learned technique in the context of a real fight by combining it with several other techniques in a Fight Simulation Drill. The effectiveness of the techniques and the revolutionary teaching system used to engineer each lesson is what makes it possible for any student to go from no knowledge to "street ready" in the absolute least amount of time possible! Gracie Combatives is the most comprehensive instructional series ever produced by the Gracie Family. 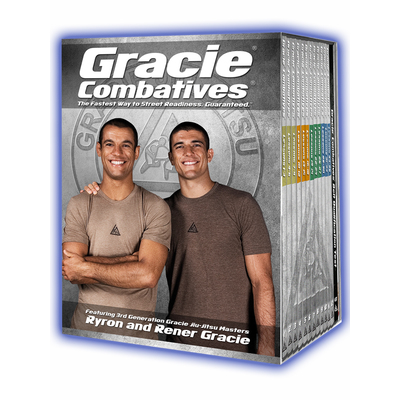 Comprised of 13 DVDs and over 18 hours of instruction, this collection features every detail of every technique that must be mastered before one is considered for Gracie Combatives belt. 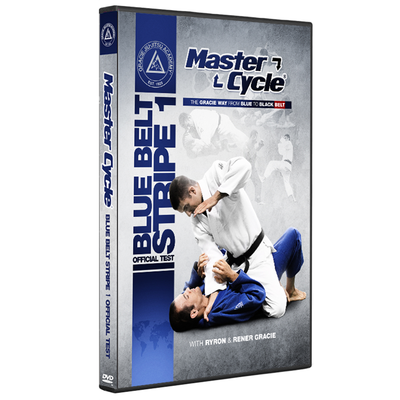 On the 13th DVD of the collection, you will find a complete demonstration of the Gracie Combatives Belt Qualification Test that one must pass to qualify for a promotion. If, after several months of dedicated practice, you become extremely proficient in the execution of the five Gracie Combatives Belt Qualification Drills (GCBQDs), you are invited to test for promotion at any Certified Gracie Jiu-Jitsu Training Center. If you do not live near an accredited school, you can also test for promotion using the revolutionary Gracie Video Evaluation Process. Through this process, you will digitally record your performance of the five GCBQDs, and then upload the videos to the Internet at www.GracieUniversity.com. Once uploaded, the videos will be viewed by a Gracie University instructor. If your accuracy, efficiency, and reflexes meet Gracie University standards, your name will be added to the list of Certified Belt Holders and we will mail you an official Gracie Combatives Belt! Over the last 85 years, the 36 techniques featured in the Gracie Combatives program have proven to be the simplest and most reliable for street self-defense against a larger opponent. As a result, Gracie Combatives is the most effective DVD series for new students looking to gain maximum self-defense effectiveness in the least amount of time. But, training for the streets and training for tournaments are two entirely different things. If your sole training objective is to prepare for point-based BJJ tournaments, this DVD series is not for you. If, on the other hand, you train at a sport BJJ school and would like to gain some awareness as to the technical and philosophical difference between sport and street jiu-jitsu, and you would like to learn the techniques that you will almost certainly need in a real fight against a more athletic opponent, this collection is an absolute must! Along with the 13 DVDs, you will receive a 65-page handbook and the Gracie Combatives Fight Chart. The handbook contains insightful information on the principles of Gracie Jiu-Jitsu which, once understood, will enable you to solve any problems that may arise during training sessions. It also includes a recommended training schedule, the Gracie Combatives belt checklist, and a one-page outline for each lesson with note space. The Fight Chart is a poster-size (24"x36") flowchart that illustrates all the ways in which the 36 techniques connect during the four phases of a real fight. This color-coded visual representation of the techniques will be most valuable to you when you are preparing for the Gracie Combatives Belt Qualification Test. Don't let the price of the Gracie Combatives collection fool you. This is undoubtedly the most comprehensive instructional DVD series ever released by the Gracie Family, and there is only one reason it's being offered at such an affordable price you can't afford to miss out of. The standard Gracie Combatives DVD Package includes 13 DVDs (each with the approximate running time of 90 minutes, except for the 13th DVD which features the Gracie Combatives Belt Qualification Test), the 65-page Gracie Combatives Belt Qualification Handbook, and the poster-size 24"x36" Gracie Combatives Flowchart. The DVD aspect ratio is 4:3. This DVD is region free (NTSC) and is formatted to play on any region free DVD player. "Guys, I just wanted to extend my appreciation for the great job you did with the "Gracie Combatives" DVD program. When my set was delivered, I was immediately impressed with the packaging, the art work on the box, cases, and discs, the extras like the handbook (the note taking space is a godsend! ), the poster (I framed it and hung it on my wall!) and the production quality of the videos. The instructional format is superb and the quality of the lessons we get from you guys is nothing short of amazing. Your Dad (and Grand Father) must be proud. This was obviously a professional job and not some sloppy rushed to market a bunch of junk. All of this for a price that proves sometimes things that good can be true. For what little this costs, I can't believe what I have here. I'm loving my training under the Gracie brothers. Bravo again, men!" The Standard Gracie Combatives DVD Package includes 13 DVDs (each with the approximate running time of 90 minutes, except for the 13th DVD which features the Gracie Combatives Belt Qualification Test), the 65-page Gracie Combatives Belt Qualification Handbook, and the poster-size 24"x36" Gracie Combatives Flowchart. With the Gracie Combatives Elite Access package, you get the Standard DVD Package, but you also get unlimited access to the complete Gracie Combatives curriculum online at GracieUniversity.com at a price 50% cheaper than what you would pay if you purchased the online course separately or at a later date. With your purchase of the online Gracie Combatives curriculum, not only can you watch your lessons on any computer, but you can keep training 24/7 since all your lessons can also be viewed from any smartphone or tablet! In addition, with Elite Access you will receive exclusive access to tons of interactive features such as chat rooms with fellow practitioners, technique forums which are moderated by official Gracie Jiu-Jitsu Certified Instructors, and you will get access to detailed lesson printouts that do not come with DVD collection. Online access will be especially useful when you are traveling without your DVDs. If you purchase the Gracie Combatives Elite Access Package, we will drop your DVD box set in the mail immediately, and we will manually unlock the online Gracie Combatives course within one business day after you place your order so you can get started right away. In order for us to give you online access, however, you must already have a Gracie University student profile. If you don't, please go to www.GracieUniversity.com after you complete this transaction and create a free student profile. It will only take a minute, and it will allow us to unlock the course in your online lesson library. If you do not create this Gracie University student profile, we cannot grant you access to your online lessons. If you purchased the Gracie Combatives DVD collection before the Elite Access Package was available, but you would like to gain access to the online Gracie Combatives course, you have the opportunity to pay the difference ($72+s/h) and receive complete Gracie Combatives online access through GracieUniversity.com. If you make this purchase, we will need to verify that you already have, in fact, purchased the complete Gracie Combatives DVD curriculum before we process your Online Add-on request (Please note: the Gracie Combatives Online Add-on option is only applicable for prior Gracie Combatives DVD set purchases within GracieLifestyle.com. Any Gracie Combatives DVD purchases from any other sites do not qualify). If you purchased the Gracie Combatives online curriculum before the Elite Access Package was available, but you would like to own the program on DVD as well, you have the opportunity to pay the difference ($47.85+s/h) and receive the complete Gracie Combatives DVD collection. If you make this purchase, we will need to verify that you already have, in fact, purchased the complete Gracie Combatives online curriculum before we process your DVD Add-on request. Please Select a Gracie Combatives purchase option from the drop-down, and then click "ADD TO CART" to proceed to checkout. Very professional, clear, concise. Best way to learn the basics of BJJ. Both Gracie brothers do a terrific job guiding you through a well designed and thought-out course. I can't recommend it enough. Get this series. Get actual instruction as well but use this course to gain an understanding before actual training or clarify and review during. Great job! This is the package for you if you want to learn Gracie Jiu-Jitsu! I purchased this set almost two years ago and have never, ever regretted it! I run a Gracie Garage and use the online and DVDs weekly. Having two options is well worth the slightly extra cost over just the DVDs. This entire program is fantastic and Rener and Ryron's teaching styles are very effective and easy to follow. Anyone wishing to learn Gracie Jiu-Jitsu needs to purchase this program and get practicing right away! Keep it Real! I love the DVD set. I am glad that I decided to purchase the package deal instead of just buying the DVD's. It is easier to travel knowing that I can leave my DVD's at home and still train from the materials online. The breakdown poster was awesome too. I'm only a couple lessons into the series, and I just signed up for a local bjj gym as well, a couple of classes into that. Really impressed by the technique, technique, technique of Gracie jiu jitsu, and of the workout I'm getting in the BJJ gym as well. Specifically, I love how you guys present the material so clearly, step after step. Its daunting to think there are at least 600 different techniques in this art, but comforting to know there are 36 basic ones that can get me started. 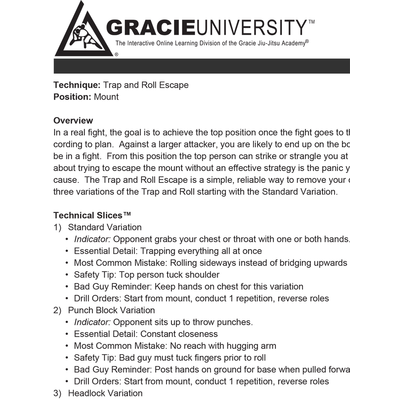 Gracie Combatives Detailed Lesson Printouts View Sale! Master Cycle: Blue Belt Stripe 1 - Official Test View Sale!